November last year I sat in a teacher’s classroom chatting about her hopes for the year. I looked around her room and saw a library filled with books that any middle schooler would want to read and commented on one of her walls, filled with photos of 6th graders at the local zoo and letters they had written to the newspaper and city commissioners about the horrible condition of the zoos. Her cell phone rang and she excused herself to talk to a parent of a student new to her and invited me to look around the room. Ever since I was little I have wanted to be two things an engineer and a writer for a tv show. I always wanted to be the guy that was funny & was smart about how he was funny. I spent fourth and fifth grade learning about shows like “The Simpsons” or “Sienfeld” two very different shows but still very funny. I spent this time writing a show called “Grasious with other people’s money” & I made about 12 20 min episodes & my older brother said it was bad so I flushed it down the toilet, my dream with it. And this was his last entry. The following pages were blank. When she returned from the phone call, I asked her about Kai’s entry, and she admitted that she hadn’t read it. “I have the hardest time with writer’s notebooks. 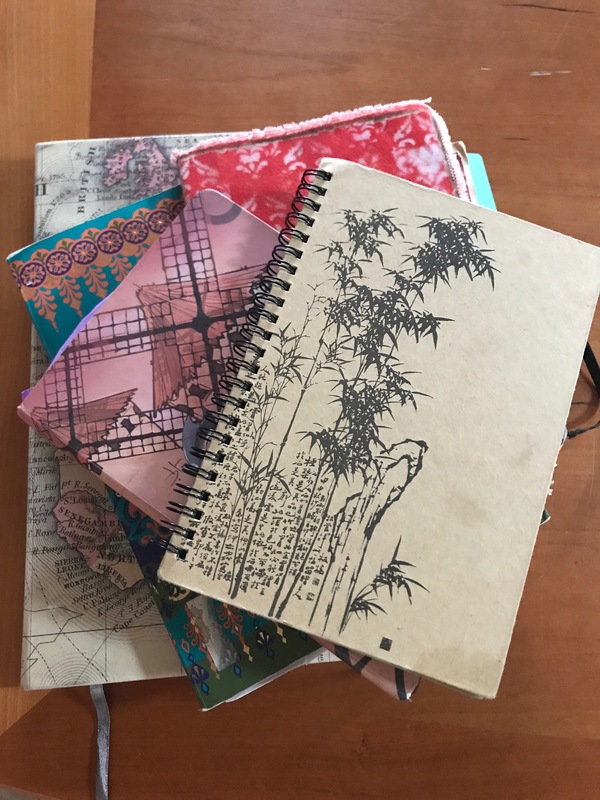 I know they’re important, but I just can’t figure out how to make them work especially with everything else that we have to do.” Her honest answer was one that I hear often from middle and high school teachers: the will is there but the skills for sustaining the writer’s notebook aren’t yet in place. Lately I’ve been thinking a lot about this teacher and reflecting on why writers’ notebooks are so important to me. In fact, I can’t imagine teaching writing without that notebook. Why? Because I know that’s how I work and I know how valuable that notebook is to me. What I wish I had asked that teacher is about hers. Does she keep one? When does she turn to it? How does she use it? 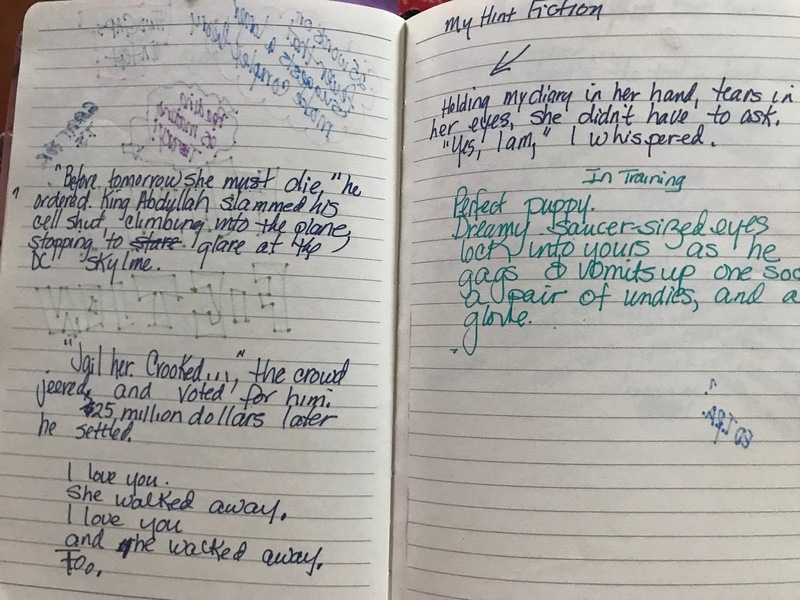 Is the writer’s notebook (WNB) a part of her writing routine? Here’s what I’ve come to learn: a teacher has to know from the inside out the value of a WNB. Keeping one has to be authentic, starting with the teacher herself. Without that insight, teachers have a hard time sustaining their students’ use of a WNB. Too often either the WNB fades after the first month or two of school or morphs into another school task: an assignment the teacher made, a commodity to be sold for the payment of a grade. And here’s what else I’ve come to learn: launching the WNB matters. 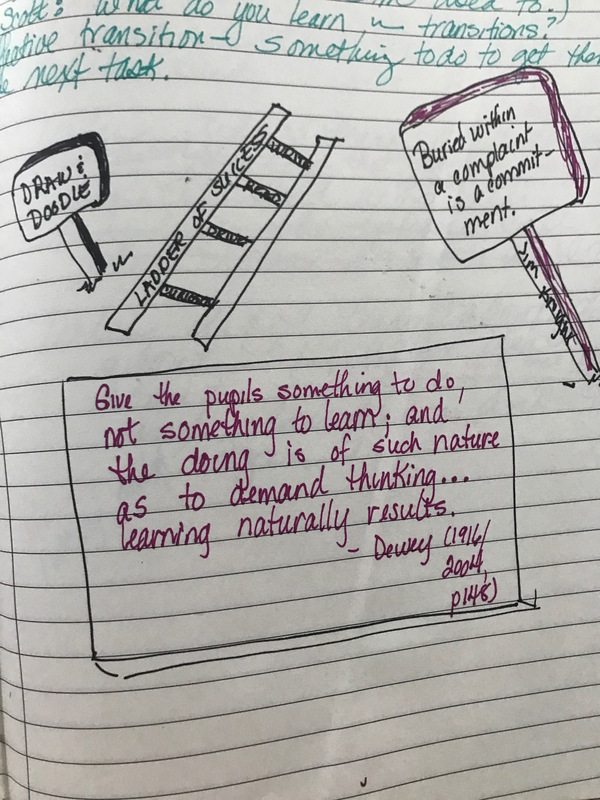 But launching means creating a vision for the power of a WNB and designing the work so that students have ownership in it. I started playing more with my WNB, adding photos I wanted to write about, trying a poem out, playing with colors, wishing that I could make mine as beautiful as Linda Rief’s. So what would I do to launch that writer’s notebook? First, I’d share several of my WNBs. I’d share several because each of my WNBs are a bit different. 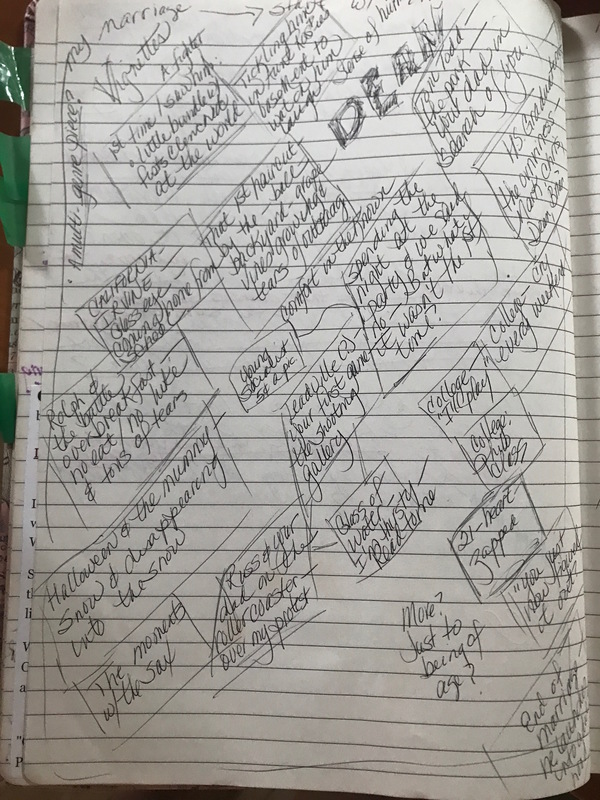 In my electronic notebook (yes, I have one of those), I have a section for collecting cool words and poems I love, but in my WNB from early this summer, I’ve played with sketch noting and added more heart maps. In my recent WNB, I’m playing with white space, thinking about how I can write sideways or create a concrete poem. I have entries about the passing of my dog: a poem, a Facebook entry, a vignette. Students would see how in some of my WNBs I’ve created indexes and divided my notebook into sections, using sticky notes to separate those sections: Here’s where I keep goofy words I’ve read, and here’s where I’ve copied down poems that I love and might emulate, and there’s where I’m keeping random thoughts about a topic I’m exploring. They would see that on the first page I’ve written myself a letter about my hopes and plans for this WNB, but this opening letter is a new routine for me. I might also show a few entries in my WNB that were seeds that grew into future writing. I imagine that I might make a photocopy a few entries and then show how they turned up in Clock Watchers or Just Right Challenge or even in this blog. And why would I do that? To show how sometimes WNBs are storage units and sometimes they’re gardens where seeds are planted, as Ralph Fletcher states. But not only would I share mine, I’d share the journals of famous people along with their quotes. I imagine that I’d make a poster with excerpts from Ray Bradbury, Einstein, JR Rowling, some pop musicians kids might know, and then I’d pepper the room with books like Steal Like an Artist and Joan Didion’s South and West. I want them to build a vision for the WNB that includes the myriad of ways that writers and thinkers use WNBs. I want them to know that the WMB is authentic – something that happens in the world outside of school. Too often – and lordy, was I guilty of this! – teachers co-opt WNBs – with the best of intentions. They become objects to meet the demands of assignments rather than a vehicle for a writer to play and take risks and gallop around with ideas galore. Teachers — again with the best of intentions — set up a section for vocabulary, for taking notes, for collecting grammar rules, for responding to prompts. They worry about accountability. But I want students to set up their WNBs in a way that works for them and to be accountable to themselves as evolving writers. I want them to own that WNB and to see that the WNB is much more than a task the leads to a grade. I want to show students like Kai how their WNB might be a place for them to study a genre, like he did as he studied The Simpsons and Seinfeld. I think of Daniel Pink’s triad of elements that lead to motivation: autonomy, mastery, purpose. Those three elements need to be in place. Autonomy (or choice): a metaphorical room of my own (thanks Virginia Woolf!). No one assigned sketch noting to me, I got to decide. Purpose: No one told me my purpose. I got to discover it and then write about it in my opening letter to myself. Mastery: No one told me what I had master: I had my own purpose and knew that I could work to it. Does that mean I wouldn’t assign quick writes or have students create heart maps or make lists of their writing territories (ala Nancie Atwell) or study and emulate craft? Oh, we’d definitely do all that, but I’d urge students to figure out what else they needed in order to grow as writers and then to set some goals. For instance, they might want to write daily outside of school for a month. Or they might want to analyze more craft in writing than what they’re doing in class. They might want to play around with different genres or include more art or make reading and writing connections. I want them to have ownership of the WNB. And how would I know that they’re using their WNBs? Conferences. A routine for conferring with students during reading or writing workshop is to check with them about how the WNB influenced their reading, writing, thinking. When I confer, part of the conference would be to look through WNBs and to gently nudge through questions about how their current writing project was shaped by seeds planted in their WNB – a positive presupposition. Before a Socratic seminar, I’d ask how the WNB helped them prepared for the seminar. It’s a sad fact that our middle school “Lost and Found” bins seem to collect so many writer’s notebooks in particular. Whenever I leaf through these, I invariably discover that they are used mainly for note taking, with a few sketchy entries and a few responses to prompts. In elementary school, writer’s notebooks are introduced with much fanfare and joy, decorated with such celebration, and remain at the center of daily writing work. Something of this joy and purpose seems to get lost in middle school, just when most kids feel ready to explore deeper ideas and experiment with their writing voices. I want students like Kai to keep thinking in the WNB: to take risks, to be vulnerable, to play. I don’t want blank pages following a few entries. WNBs are much too important to let them just gather dust on the shelves of our classrooms.